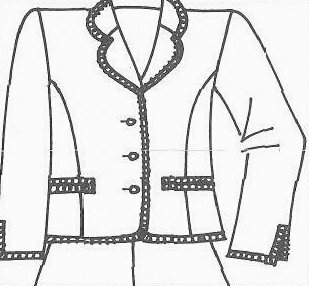 style of ladies' clothing - applied most commonly to suits - produced from a fabric of carded yarns (especially woollen tweeds). Distinguished by the comfort and simplicity of its design, which is set off by the contrast of the borders, pockets, collar and sleeves of a jacket which is decorated with braiding, velvet ribbon or another differing fabric. This style was established by Coco Chanel, well-known Parisian fashion designer and owner of the famous Haute Couture salon, whose conviction it was that a suit in this style would suit every woman. This was proven by events, as it has enjoyed great popularity for more than fifty years.